RTI Surgical® Announces 2016 Fourth Quarter, Full Year Results; Initiates Actions to Improve Execution and Return to Profitable Growth - RTI Surgical Holdings, Inc.
ALACHUA, Fla. (Feb. 23, 2017) – RTI Surgical Inc. (RTI) (Nasdaq: RTIX), a global surgical implant company, reported operating results for the fourth quarter and full year of 2016. The company also outlined new actions focused on improving execution and returning the company to profitable growth. RTI’s board and management team have pivoted the company toward growth areas, such as opportunities in the direct business that are beginning to yield early results. The company also initiated a restructuring program that is expected to achieve cost savings and position RTI’s operating platform to capitalize on future growth opportunities. As announced in January, the Board appointed Camille Farhat, an experienced executive and growth-focused leader with proven expertise in revitalizing and growing global health care businesses, to chief executive officer. Mr. Farhat will assume the position on March 15, 2017. RTI’s fourth quarter and full year 2016 financial results, as outlined in greater detail below, reflect that the company has initiated steps in the quarter to improve the operational performance and financial results of its overall business going forward. 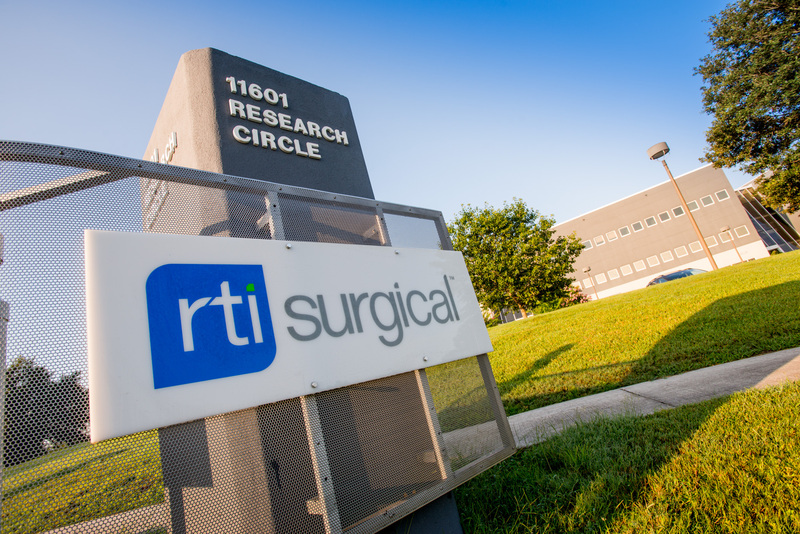 RTI has delivered strong performance in its direct business, with double-digit growth reported in its spine, surgical specialties, cardiothoracic and international businesses. While RTI’s commercial/other business declined during 2016, primarily due to extraordinarily high commercial orders in 2015, the business did show signs of stabilization during the year. RTI reported a net loss of $12.0 million in 2016’s fourth quarter, or $0.21 per fully diluted common share, mainly due to pre-tax charges totaling $16.0 million related to excess hernia and sports medicine inventory and asset impairment of the company’s German subsidiary. As outlined in the reconciliation tables that follow, excluding these charges, adjusted net income per fully diluted common share was $0.01 and adjusted earnings before interest, taxes, depreciation and amortization (adjusted EBITDA) was $6.1 million for the fourth quarter of 2016. Worldwide revenues were $71.3 million for the fourth quarter of 2016, a decrease of 6 percent, domestic revenues were $64.6 million, a decrease of 9 percent, and international revenues were $6.8 million, an increase of 24 percent from 2015’s fourth quarter. The decrease in domestic revenue was primarily due to lower orders in the commercial /other business in 2016 coming off a very strong 2015; partially offset by strong growth in the domestic direct businesses. The increase in international revenues was mainly driven by growth in Asia, primarily in Spine. Direct revenues were $44.5 million for the fourth quarter of 2016, an increase of 22 percent compared to the fourth quarter of 2015, with particular strength in Spine. RTI’s spine business continues to be one of the fastest-growing spine businesses in the U.S., primarily due to increases in surgeon users and distributor relationships. Commercial/other revenues were $26.8 million for the fourth quarter of 2016. The company has begun implementing restructuring actions targeted at rightsizing investments toward those businesses and market areas with the greatest potential for long-term growth. This effort is ongoing and is expected to result in both cost savings and additional revenue opportunities over the near- and long-term. Worldwide revenues were $272.9 million for the full year 2016, a decrease of 3 percent compared to revenues for the full year 2015, mainly due to the same factors impacting fourth quarter 2016 worldwide revenues. Domestic revenues were $247.8 million for the full year 2016, a decrease of 5 percent compared to domestic revenues for the full year 2015. International revenues were $25.1 million for the full year 2016, an increase of 15 percent compared to international revenues for the full year 2015. On a constant currency basis, international revenues for the full year 2016 increased 15 percent compared to international revenue for the full year 2015. Direct revenues were $160.8 million for the full year 2016, an increase of 16 percent compared to direct revenues for the full year 2015. The company experienced double digit growth in the spine, surgical specialties, cardiothoracic, and international businesses. Commercial/other revenues were $112 million for the full year 2016, a decrease of 22 percent compared to commercial/other revenues for the full year 2015. The decline in commercial/other business is primarily related to significantly high orders in 2015 with lower orders in 2016, however the commercial business showed signs of stabilization during the year. In addition, RTI is taking actions to reinvigorate this business by strengthening relationships and investing in innovation. During the year, the company recorded pre-tax charges totaling $25.6 million as follows: $9.6 million related to hernia and sports medicine inventory, $5.6 million related to asset impairment of the company’s German subsidiary, $1.2 million related to strategic review costs, $4.4 million related to CEO transition and retirement costs, $2.7 million related to contested proxy costs, $1.1 million related to restructuring, and $1 million related to severance. In addition, the company also recorded a foreign net operating loss valuation reserve of $1.2 million. Net loss applicable to common shares was $18.1 million for the full year 2016, compared to net income applicable to common shares of $11.6 million for the full year 2015. Net loss per common share was $0.31 for the full year 2016, based on 58.2 million common shares outstanding, compared to net income per fully diluted common share of $0.20 for the full year 2015, based on 58.6 million fully diluted common shares outstanding. As detailed in the reconciliation provided later in this release, adjusted net income applicable to common shares was $2.1 million for the full year 2016, compared to adjusted net income applicable to common shares of $13.4 million for the full year 2015. Adjusted net income per fully diluted common share was $0.04 for the full year 2016, based on 58.5 million fully diluted common shares outstanding, compared to adjusted net income per fully diluted common share of $0.23 for the full year 2015, based on 58.6 million fully diluted common shares outstanding. Adjusted earnings before interest, taxes, depreciation and amortization (adjusted EBITDA), as detailed in the reconciliation provided later in this release, was $29.8 million for the full year 2016 (11 percent of 2016 revenues) compared to $46.3 million for the full year 2015 (16 percent of 2015 revenues). RTI will remain focused in 2017 on execution, continued innovation and profitable growth across each of its business lines and geographies. The company has developed its guidance based on a conservative view of its current restructuring and operational improvement program, its current business profile and existing market conditions. Within this context, RTI expects full year revenues for 2017 to be between $274 million and $285 million. Compared to the full year 2016, direct revenue is expected to grow mid-to-high single digits on a percentage basis, while commercial/other revenue is expected to account for a relatively flat to low single-digit decline on a percentage basis. As detailed in the reconciliation provided later in this release, excluding the approximately $4 million pre-tax charge for severance-related expenses in 2017 as noted above, adjusted full year net income per fully diluted common share is expected to be in the range of $0.05 to $0.10, based on 59.5 million fully diluted common shares outstanding. RTI will continue to evaluate its operating platform throughout the year and will update its 2017 top- and bottom-line guidance as its actions might warrant. RTI will host a conference call and simultaneous audio webcast to discuss its fourth quarter and full year results at 8:30 a.m. ET today. The conference call can be accessed by dialing (877) 383-7419. The webcast can be accessed through the investor section of RTI’s website at www.rtix.com. A replay of the conference call will be available on the RTI website following the call. Full year net income per fully diluted common share is expected to be in the range of $0.01 to $0.06, based on 59.5 million fully diluted shares outstanding. Excluding severance charges taken in 2017, full year net income per fully diluted common share is expected to be in the range of $0.05 to $0.10. To supplement the Company’s unaudited condensed consolidated financial statements presented on a GAAP basis, the Company discloses certain non-GAAP financial measures that exclude certain amounts, including Adjusted EBITDA, Adjusted Net Income Applicable to Common Shares and Adjusted Net Income per Common Share - Diluted. The calculation of the tax effect on the adjustments between GAAP net (loss) income applicable to common shares and non-GAAP net income applicable to common shares is based upon our estimated annual GAAP tax rate, adjusted to account for items excluded from GAAP net (loss) income applicable to common shares in calculating Adjusted Net Income Applicable to Common Shares-Diluted. A reconciliation of the non-GAAP financial measures to the corresponding GAAP measures is included in the tables listed above. (1) 2016 Excess inventory charge – This adjustment represents an inventory charge as a result of writing-off certain excess product quantities primarily for excess hernia and sports medicine inventory. Management removes the amount of these expenses from our operating results to supplement a comparison to our past operating performance. (2) 2016 Strategic review costs – This adjustment represents charges relating to a comprehensive strategic review of the Company’s business lines and operations to leverage the Company’s expertise, technology and products and identify opportunities to increase stockholder value. Management removes the amount of these expenses from our operating results to supplement a comparison to our past operating performance. (3) 2016 CEO Retirement and transition costs – This adjustment represents charges relating to the retirement of our Chief Executive Officer, Brian K. Hutchison, pursuant to the Executive Transition Agreement dated August 29, 2012 and Executive Separation Agreement dated August 15, 2016. Management removes the amount of these expenses from our operating results to supplement a comparison to our past operating performance. (4) 2016 Contested proxy expenses – This adjustment represent charges relating to contested proxy expenses. Management removes the amount of these costs from our operating results to supplement a comparison to our past operating performance. (5) 2016 and 2015 Asset impairment and abandonments – This adjustment represents an asset impairment in 2016 and abandonment of certain long-term assets at our German facility in 2015. Management removes the amount of these costs from our operating results to supplement a comparison to our past operating performance. Due to the significant effort that is required to determine the fair value of German facility’s long-lived assets, the Company was unable to finalize the 2016 long-lived asset impairment analysis as of the date of this release. The Company will finalize the impairment analyses and reflect the finalized fair value in its December 31, 2016 Form 10-K. The long-lived asset impairment reported in this release is the Company’s current best estimate of the impairment amount. (6) 2015 Litigation and settlement charges – This adjustment represents charges relating to settlements of domestic and international distributor disputes. Management removes the amount of these costs from our operating results to supplement a comparison to our past operating performance. (7) 2016 Restructuring charges – This adjustment represents the closure of our French distribution and tissue procurement office. Management removes the amount of these costs from our operating results to supplement a comparison to our past operating performance. (8) 2016 and 2015 Severance charges – This adjustment represents charges relating to the termination of former employees. Management removes the amount of these costs from our operating results to supplement a comparison to our past operating performance. (9) 2016 Foreign net operating loss valuation reserve – This adjustment represents charges relating to a foreign net operating loss valuation reserve. Management removes the amount of these costs from our operating results to supplement a comparison to our past operating performance. Adjusted EBITDA, Adjusted Net Income Applicable to Common Shares and Adjusted Net Income per Common Share - Diluted should not be considered in isolation, or as a replacement for GAAP measures. The Company believes that presenting Adjusted EBITDA, Adjusted Net Income Applicable to Common Shares and Adjusted Net Income per Common Share - Diluted in addition to the related GAAP measures provide investors greater transparency to the information used by management in its financial decision-making. The Company further believes that providing this information better enables the Company’s investors to understand the Company’s overall core performance and to evaluate the methodology used by management to assess and measure such performance.